Check out this unique slot that combines classic three reel slots with a modern, fun twist. Click here to play! Spin the reels for a chance to pull in plenty of big wins! The best part about this slot is the fact that it's actually six 3 reel games in one! That's six chances to win, and in order to do that you'll need to watch out for the top paying symbols. Firstly is the star symbol. This little, blue symbol is a wild and will not only replace other symbols to help you bring in more wins, but it will also multiply your line win if you spin one or two in a winning combination. On top of that, if you spin three of them across the single pay line in any of the six games, you'll get up to 1600 coins! Also helping you pull in the win are the lucky sevens. These red numerals will bring in up to 200 coins if you spin three across the pay line in any of the games. It wouldn't be classic slots without BARS and cherries. Watch out for these symbols as well because they will pay out as well! This game accepts a maximum of two coins, so be sure to wager both, as it will activate the highest pay table. 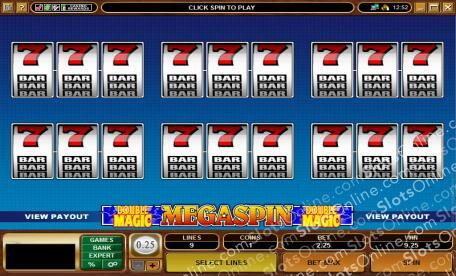 MegaSpin Double Magic is an excellent chance to spin up plenty of cash! The blue star symbol will replace all other symbols to help you bring in more wins. It will also pay out the top prize of 1600 coins if you spin three across any of the pay lines.